Awolo was a Nigerian nationalist and statesman who played a key role in Nigeria’s independence movement, the First and Second Republics and the Civil War. He is most notable as the outstanding first premier of the Western Region but was also a successful federal commissioner for finance and vice president of the Federal Executive Council in the Civil War and was thrice a major contender for his country’s highest office. A native of Ikenne in Ogun State of south-western Nigeria, he started his career, like some of his well-known contemporaries, as a nationalist in the Nigerian Youth Movement in which he rose to become Western Provincial Secretary. Awolowo was responsible for much of the progressive social legislation that has made Nigeria a modern nation. He was the first Leader of Government Business and Minister of Local Government and Finance, and first Premier of the Western Region under Nigeria’s parliamentary system, from 1952 to 1959. He was the official Leader of the Opposition in the federal parliament to the Balewa government from 1959 to 1963. In recognition of all these, Awolowo was the first individual in the modern era to be named Leader of the Yorubas (Yoruba: Asiwaju Awon Yoruba or Asiwaju Omo Oodua). Obafemi Awolowo was born on 6 March 1909 in Ikenne, in present-day Ogun State of Nigeria. His father was a farmer and sawyer who died when Obafemi was about seven years old. He attended various schools, and then became a teacher in Abeokuta, after which he qualified as a shorthand typist. Subsequently, he served as a clerk at the famous Wesley college, as well as a correspondent for the Nigerian Times. It was after this that he embarked on various business ventures to help raise funds to travel to the UK for further studies. Following his education at Wesley College, Ibadan (a teachers’ college), in 1927, he enrolled at the University of London as an External Student and graduated with the degree of Bachelor of Commerce (Hons.). He went to the UK in 1944 to study law at the University of London and was called to the Bar by the Honourable Society of the Inner Temple on 19 November 1946. In 1949 Awolowo founded the Nigerian Tribune, the oldest surviving private Nigerian newspaper, which he used to spread nationalist consciousness among his fellow Nigerians. While in London, Awolowo formed in 1947 the Egbe Omo Oduduwa, an association dedicated to the preservation and advancement of Yoruba culture in the new world conditions. Thereafter, he founded the Action Group in 1951. This party, alone among the major political parties, demanded immediate independence based on federalism. He led the Action Group (which was also the first Nigerian party to write and present an election manifesto) to victory in the Western Regional elections of 1951 and was named Leader of Government Business and Minister for Local Government and Finance, ultimately becoming the first premier of the Region when it was elevated to a federating unit in 1954. As the leader of the Action Group, Awolowo represented the Western Region in all the constitutional conferences intended to advance Nigeria on the path to independence. He was the official Leader of the Opposition to the Balewa Government from 1959 to 1963 after he had left the Western Region to contest elections to the prime ministership of Nigeria at the centre. He was chosen by the Yoruba elite as their political leader or, formally, Leader of the Yorubas, during the peak goodwill period following his release from imprisonment for about three years on the charge of plotting to overthrow the national government, and was later appointed Federal Commissioner for Finance and Vice-President of the Federal Executive Council in Yakubu Gowon’s Federal Military Government during the Civil War. In those capacities, he played a major role in preserving the Nigerian federation. As chairman and presidential candidate of the Unity Party of Nigeria, which contested the elections of 1979 and 1983 on a welfarist platform, Awolowo polled the second highest number of votes.He retired from politics on the termination of the Second Republic in 1983. Awolowo remains perhaps Nigeria’s most controversial politician. He has been attacked for electorally defeating Nnamdi Azikiwe, a then more nationally prominent political figure and an Igbo from the neighbouring Eastern Region, in the contest to control the West, Awolowo’s home region. He has also come under attacks from these crusaders for what they alleged to be his hard-line stance against the secessionist Igbos of the Eastern Region in the Civil War. He was equally regarded by most Hausa-Fulani politicians as the major threat to the ethno-religious hegemony of their people in Nigeria. Nevertheless, he is widely revered for his strong nationalist activism, which roused the National Council of Nigeria and the Cameroons (NCNC) nationalists out of their complacency and helped hasten the march to independence. This was attained in 1960 following early home rule for the people of the Western Region which Awolowo secured in 1957. He is also admired for his major role in saving the federation in the Civil War and for his dynamic and welfarist leadership. In particular, he pioneered Nigeria’s free primary education and free health care programmes and implemented the first minimum-wage policy by a Nigerian government at any level; he also established the first television service in Africa and the first Nigerian university (The University of Ibadan) whose creation was not even recommended by the Federal Government of the day. Awolowo was Nigeria’s foremost federalist. In his Path to Nigerian Freedom (1947) – the first systematic federalist manifesto by a Nigerian politician – he advocated federalism as the only basis for equitable national integration and, as head of the Action Group, he led demands for a federal constitution, which was introduced in the 1954 Lyttleton Constitution, following primarily the model proposed by the Western Region delegation led by him. As premier, he proved to be and was viewed as a man of vision and a dynamic administrator. Awolowo was also the country’s leading social democratic politician. He supported limited public ownership and limited central planning in government. He believed that the state should channel Nigeria’s resources into education and state-led infrastructural development. Controversially, and at considerable expense, he introduced free primary education for all and free health care for children in the Western Region, established the first television service in Africa in 1959, and the Oduduwa Group, all of which were financed from the highly lucrative cocoa industry which was the mainstay of the regional economy. Excluded from national government, Awolowo and his party faced an increasingly precarious position. Akintola’s followers, angered at their exclusion from power, formed the Nigerian National Democratic Party (NNDP) under Akintola’s leadership. Having previously suspended the elected Western Regional Assembly, the federal government then reconstituted the body after manoeuvres that brought Akintola’s NNDP into power without an election. Shortly afterwards Awolowo and several disciples were arrested, charged, convicted (of treason), and jailed for conspiring with the Ghanaian authorities under Kwame Nkrumah to overthrow the federal government. The remnants of the Action Group fought the national election of 1965 in alliance with the largely Igbo, and south-eastern NCNC. Amid accusations of fraud from the NCNC-AG camp, the NPC-NNDP won the election; the AG supporters reacted with violent riots in some parts of the Western region. Awolowo was later freed by the military administration of General Yakubu Gowon who subsequently appointed him Federal Commissioner for Finance and Vice-President of the Federal Executive Council. This took place in the unsettled circumstances immediately preceding the Civil War. Awolowo pioneered free primary education in Nigeria in the Western Region and also free health care. Although Awolowo failed to win the 1979 and 1983 presidential elections of the Second Republic, he polled the second highest number of votes and his polices of free education and limited free health were carried out throughout all the states controlled by his party, the Unity Party of Nigeria. Awolowo is best remembered for his remarkable integrity, ardent nationalism, principled and virile opposition, and dogged federalistic convictions. His party was the first to move the motion for Nigeria’s independence in the federal parliament and he obtained internal self-government for the Western Region in 1957. He is credited with coining the name “naira” for the Nigerian standard monetary unit and helped to finance the Civil War and preserve the federation without borrowing. He built the Liberty Stadium in Ibadan, the first of its kind in Africa; established the WNTV, the first television station in Africa; erected the first skyscraper in tropical Africa: the Cocoa House (still the tallest in Ibadan) and ran a widely-respected civil service in the Western Region. Awolowo was reputedly admired by Ghana’s Kwame Nkrumah, and some of his disciples in the South-West have continued to invoke his name and the policies of his party, the Action Group, during campaigns, while his welfarist policies have influenced politicians in most of the other geopolitical zones of the nation. He was a Senior Advocate of Nigeria and Chancellor of the University of Ife (his brainchild) and Ahmadu Bello University. He held many chieftaincy titles, including those of the Losi of Ikenne, Lisa of Ijeun, Asiwaju of Remo, Odofin of Owo, Ajagunla of Ado-Ekiti, Apesin of Osogbo, Odole of Ife and, among the Ibibios, Obong Ikpa Isong of Ibibioland. He was also conferred with the highest national honour of Grand Commander of the Federal Republic of Nigeria, a rank and a title that have ordinarily been bestowed upon the country’s presidents. 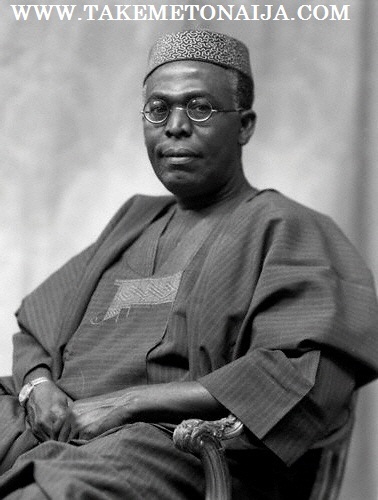 Many institutions in Nigeria have honoured him, and some regional and national institutions are named after him, including Obafemi Awolowo University in Ile-Ife, Osun State (formerly University of Ife), Obafemi Awolowo Stadium (formerly the Liberty Stadium) and the Obafemi Awolowo Institute of Government and Public Policy in Lekki, Lagos State. His portrait is on the ₦100 naira note. He was also the author of several publications on the political structure and future prospects of Nigeria, the most prominent of which are Path to Nigerian Freedom, Thoughts on the Nigerian Constitution, and Strategies and Tactics of the People’s Republic of Nigeria. In 1992, the Obafemi Awolowo Foundation was founded as an independent, non-profit, non-partisan organisation committed to furthering the symbiotic interaction of public policy and relevant scholarship with a view to promoting the overall development of the Nigerian nation. The Foundation was launched by the President of Nigeria at that time, General Ibrahim Babangida, at the Liberty Stadium, Ibadan. However, his most important bequests (styled Awoism) are his exemplary integrity, his welfarism, his contributions to hastening the process of decolonisation and his consistent and reasoned advocacy of federalism-based on ethno-linguistic self-determination and uniting politically strong states-as the best basis for Nigerian unity. Awolowo died peacefully at his Ikenne home, the Efunyela Hall (so named after his mother), on 9 May 1987, at the age of 78, amid tributes across political and ethno-religious divides. set up Nigeria’s first commercial Housing Estates at Ikeja and Bodija, Ibadan. taken successful bold steps to revolutionise the production and marketing of cocoa by farmers in Western Nigeria; and . created the infrastructure for rural development by promoting 900 cooperative societies in about 3 years and by providing within 5 years almost 10 times as many miles of road as he inherited from the British administration. There is a not-so-visible achievement arising from all these. By making election promises and fulfilling them within a few years, Awo had led his region to evolve a culture that demandsand evaluatesa socio economic programme from those who seek to govern them.